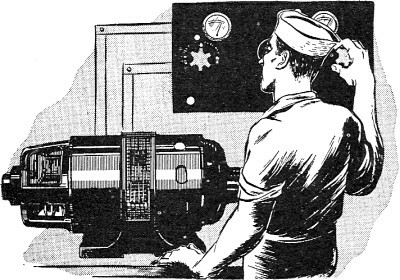 Chapter 16 of the "Electricity - Basic Navy Training Courses" introduces concepts of alternating current (AC) motors, their electric supply, and controls. It is part of the NAVPERS (Navy Personnel) 10622 series which is highly regarded both in and out of the military. The manuals were first written in the middle of the last century and have been upgraded a few times since then, but if you compare the sections like this one on AC motors in both the original and most modern versions, not much - if anything - has changed. If you have an interest in motors and want to understand the basics of how they work both as motors and generators (AC and DC), then there is not a much better source from which to start. Although there are a number of types of d-c motors, ONE, and only one, will work on a.c. It's the so-called SERIES or UNIVERSAL motor. The term "series," applied to a motor means that the field and armature are connected IN SERIES with each other. This connection is shown in figure 155. 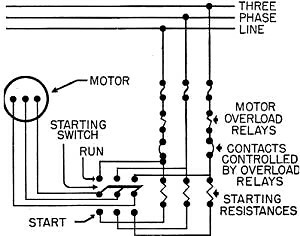 A is the wiring diagram and B is the schematic. Since the field and armature are in series they must carry exactly the same current. And this is the key to "why" a series-universal motor works in a.c. Both the armature coils and the field coils reverse current direction at the SAME instant. They reverse together because both are carrying the same current. The reversing current causes armature coils and field coils to change their POLARITY simultaneously. You know that, if BOTH armature and field change polarity, rotational direction does NOT reverse. This is proved in figure 156. A shows a motor with the current in a positive direction (instant 1 on the graph). B shows the same motor, but with current in a negative direction (instant 2 on the graph). You prove that the motor has torque in the SAME DIRECTION for both directions of current. Use the motor hand rule. Figure 155. - Series-universal motor. Figure 156. - Series motor on a.c. Figure 157. - Mutual induction polarities. The universal motor is used on food mixers, malted milk machines, cleaners, and some fans. It's THE motor that can be used on a.c. or d.c. Notice that the uses of the series-universal motor all call for fractional hp motors. The motor is not built in sizes larger than 1 hp, except for specially designed jobs. Alternating current does certain things that direct current does not do. And for this reason, most a-c motors are altogether different than d-c motors. Before you begin the study of a-c motors, it would be a good idea to review the main points on alternating current - the table at the end of Chapter 13 gives you a good outline of a.c., its fields, and inductive action. First, a.c. is NOT STEADY. Current is constantly rising and falling. Second, current does not flow in ONE DIRECTION ONLY. A.c. is constantly reversing its direction of flow. These two directions of flow are called POSITIVE and NEGATIVE in order to distinguish one direction from the other. Don't get the idea that the negative current is any weaker than the positive current - they're absolutely EQUAL in strength, and regardless of the a.c. reversing direction, it does just as much work as d.c. Alternating current, by reversing direction, produces constantly reversing flux. This constantly REVERSES THE POLARITY of a-c coils. Furthermore, the flux around an a-c coil is never steady - it is constantly expanding and contracting. This reversal of direction and constant change of value in a.c. makes possible the MUTUAL INDUCTION circuit. This is the first basic idea necessary to the understanding of a-c motors. IDEA NO. 1 - MUTUAL INDUCTION IN A.C. The first basic idea - MUTUAL INDUCTION-you are familiar with. (Review Chapter 13 for the introduction of this idea.) The important fact in mutual induction, is that the INDUCED voltage in the secondary is always OPPOSITE to the APPLIED voltage of the primary. Which means that every time the PRIMARY has POSITIVE current, the SECONDARY has NEGATIVE current - and vice versa. This is not so complex - look at figure 157. It shows two ordinary coils; P, the primary and S, the secondary. The solid arrows show current directions when the primary is POSITIVE and the broken arrows . show current directions when the primary is NEGATIVE. With a.c., the primary is positive half of the time and negative the other half of the time. A NORTH pole appears at the top of the primary coil when the current is positive. And when the primary is positive, the secondary is negative, and a SOUTH pole appears at the top of the secondary coil. The other half of the time, the primary coil is negative and has a SOUTH pole at its top. In short, a NORTH INDUCES A SOUTH, AND A SOUTH INDUCES A NORTH. Check these polarities with the hand rule for coils. Work the problems for yourself - it's the only way you'll become "good" at using the hand rules. 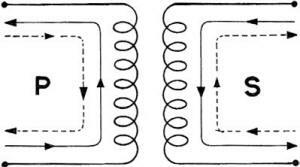 The coils of figure 157 make up a simple TRANSFORMER. And the action of ALWAYS INDUCING OPPOSITE POLARITY ON THE SECONDARY is called the TRANSFORMER PRINCIPLE or TRANSFORMER ACTION. Transformers are mutual induction devices for the transfer of voltage from a primary circuit to a secondary circuit. IDEA NO. 2 - POLYPHASE A.C. 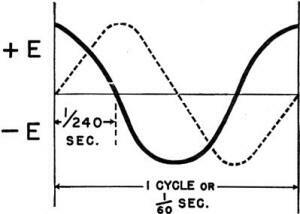 The second basic idea that you must get straight before studying a-c motors is POLYPHASE CIRCUITS. Polyphase means MORE THAN ONE TIME. The term comes from two words - "poly," meaning MORE THAN ONE and "phase," meaning TIME. Figure 158. - Two-phase alternator. Figure 159. - Two-phase voltages. Figure 160. - Two-phase voltages-electrical degrees. Figure 161. - Three-phase alternator. Figure 162. - Three-phase voltages. Figure 163. - The rotating magnetic field. Polyphase a.c. is produced by a special kind of alternator. For example, a two-phase alternator (two "times") has two separate windings in the stator. Figure 158 shows the two windings-they are placed in the stator 90° apart. Now, imagine that the rotor is turning. Notice that the Y windings are cut by the rotor's flux AFTER the X windings are cut. This causes the induced voltages in the two windings to have different TIMING. For the Two-phase system, there are TWO sets of TIMING for the rise and fall and reversing of a.c. 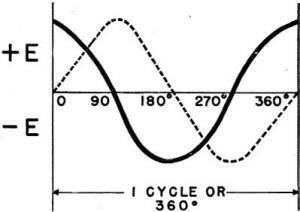 Figure 159 shows a solid line for the graph of the X winding's voltage, and a broken line for the graph of the Y winding's voltage. One cycle, produced by one revolution of the rotor, is pictured for each phase. Like all scientific measurements, there is an accurate method for measuring the OUT-OF-PHASENESS (out-of-timeness) of these two voltages. It is possible to use a standard unit of time - the second. If the rotor is revolving at 60 revolutions per second, each revolution, or cycle, takes 1/60th of a second. And, if you examine the graphs carefully, you'll find that the Y voltage is exactly one-quarter of a cycle behind the X voltage. One-quarter of 1/60th is 1/4th x 1/60th second, or 1/240th second. Which means that the Y voltage is behind the X voltage by 1/240th second. In other words - the voltages are 1/240th of a second out-of-phase. Measuring in such small fractions of a second by mechanical means is a tough job. In fact, if the unit becomes much smaller - like 1/500th second - it is well nigh impossible to measure. A much more accurate and easier unit of measure is the ELECTRICAL DEGREE. You know that a complete circle is 360°. And directly across a circle, or from ONE POINT on a circle through the center to an OPPOSITE POINT, is 180°. This gives you the definition for electrical degrees - a north pole and a south pole are opposite and they are 180 ELECTRICAL DEGREES APART. Therefore, ONE ELECTRICAL DEGREE IS 180TH OF THE DISTANCE BETWEEN A NORTH POLE AND THE NEXT SOUTH POLE. How many electrical degrees from the north to the south of the rotor in figure 158? 180 ELECTRICAL DEGREES. How many electrical degrees all the way around-from, north to south and back to north? 360 ELECTRICAL DEGREES. How many, degrees from the north to half-way to the south? 90 ELECTRICAL DEGREES. Using electrical degrees to measure phase, the X windings are 90 electrical degrees from the Y windings, which is exactly the same as saying that the Y voltage is 90° out-of-phase with the X voltage. How much simpler it is to think of "90° out-of-phase" instead of "1/240th of a second out-of-phase." Both have exactly the same meaning. The graphs of figure 159 can now be re-labeled, as in figure 160, in electrical degrees. Note that 1/60th second becomes 360°, and 1/240th second becomes 90°. 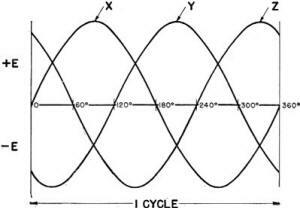 Graphs of a-c voltage like this are called SINE WAVES. Notice that the sine waves tell you exactly how much the voltages are out-of-phase (out-of-time), AND, the exact position of the coils in the alternator. If the sine waves are 90 electrical degrees apart, then the coils of the alternator, which produced the voltages, are 90 electrical degrees apart. From the two-phase system, it's an easy step to the three-phase alternator. 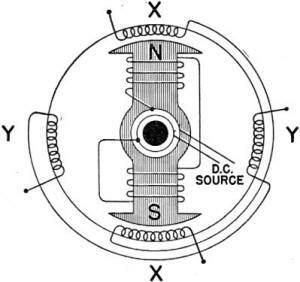 Figure 161 is a three-phase alternator. If you follow the leads of the three coils, you'll find that they are 120° apart. Therefore, the voltages produced are 120° out-of-phase. Sine waves of this three-phase system look like figure 162. Using the X voltage as a reference, the Y voltage is 120° behind the X and the Z is 120° behind the Y. DO NOT FORGET THAT 120° MEANS A DEFINITE LENGTH OF TIME - A DEFINITE FRACTION OF A SECOND. Most of the large a-c motors are three-phase jobs. Their stators are constructed exactly like the stator of a three-phase alternator (figure 161) - three separate windings - each winding displaced 120° from the others. On each winding is impressed one of the phases from a three-phase alternator. 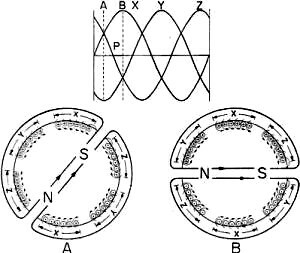 Figure 163 shows two cross-sectional views of a part of a three-phase motor stator. The current directions in A correspond to the instant marked A on the sine waves. Likewise, the current directions in B correspond to the instant marked B on the sine waves. Notice what happens - in A, the flux is forming a north pole between the X and Z windings. Use your hand rule for each conductor to prove this. In B, the current in the Z winding has changed direction and this MOVES THE POLE to between the Z and Y windings. Notice that the Z current changed direction at point, P. In short, the change in direction of current in one phase has caused the flux field to shift around the surface of the stator. This shifting of flux is true for all the other parts of the stator and also for all the other poles. It's also true for cycle after cycle. The total effect is that A MAGNETIC FIELD MOVES AROUND THE SURFACE OF THE STATOR. As each phase changes current direction the poles MOVE the width of THAT PHASE. And this field rotates FAST. The changes within phases take place every 1/360th of a second. In fact, it only takes 1/60th of a second for the field to rotate COMPLETELY around this stator. Let's make sure you've got this straight. In a three-phase motor winding, the current in each phase reverses at regular intervals - thus reversing the polarity of the phase windings. Because the phases reverse current in a regular pattern - Y reverses, then Z reverses, then X reverses and so on repeating Y, Z, X, Y, Z, X, etc. - the phases reverse polarity one after the other right around the stator surface. The rotating field is like the rotor magnet of the alternator which produced it. The ROTOR spins around inside an ALTERNATOR stator. And the ROTATING MAGNETIC FIELD spins around on the inside surface of a MOTOR stator. 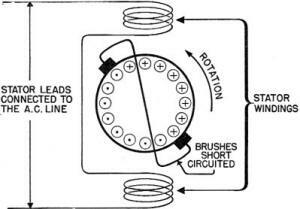 All three-phase motors use this kind of stator. But the rotors are different, according to the type of motor. This type of three-phase motor runs because of MUTUAL INDUCTION and a ROTATING FIELD. The rotor has a short-circuited winding. And as the rotating field of the stator sweeps across the rotor windings, A VOLTAGE IS INDUCED. The poles which are produced in the rotor are from INDUCED current. Therefore, they are always OPPOSITE to the poles on the stator, which induced them. What happens? 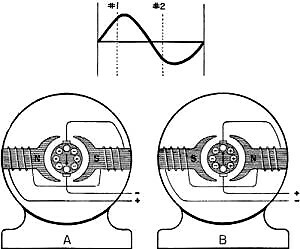 Attraction occurs between the stator and rotor poles. Since the stator poles are moving (rotating), they tend to drag the rotor poles along. Torque is produced and the rotor rotates. This motor is called the SQUIRREL CAGE motor because of the construction of its rotor. 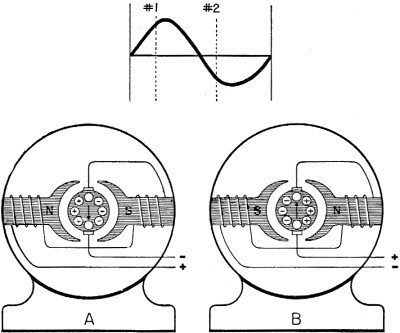 Figure 164 shows two views of the squirrel cage rotor. It consists of an iron core mounted on a shaft. And there are copper bars running in slots the length of this core. 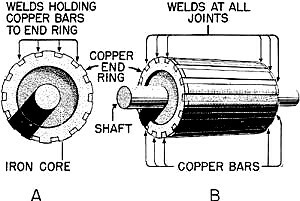 At each end, a copper END RING is welded to each and every copper bar. This makes the rotor a certain SHORT CIRCUIT. Figure 164. - The squirrel cage rotor. It is important that these rotors be absolute short circuits because they get current ONLY by induction. There are no slip rings or commutator to feed current into the rotor. The squirrel cage ROTOR is like the secondary of a transformer. The stator is like a primary. The rotor (secondary) gets its voltage by induction from the stator (primary). The squirrel cage MOTOR has many advantages and is the most widely used and popular motor in the world. It's cheap - the windings are easily set in place. It's rugged - there are no slipping contacts to get out of order. It's safe - no sparks to ignite gasoline or other explosives. This is one motor which can be run under water. It makes no difference whether the water short circuits the rotor or not - it's supposed to be a short anyway. The WOUND ROTOR MOTOR embodies the same principles of operation as the squirrel cage motor. But, wire windings' are used on the rotor of the wound rotor motor instead of using copper bars. The leads of these wire windings are brought out to slip rings where they are short circuited by a rheostat. Just as in the squirrel cage, a voltage is induced in the rotor, current flows in the short circuit, and torque is produced by the pull of the rotating field. For certain jobs, where SPEED CONTROL and a GOOD START are necessary, the wound rotor motor is better than the squirrel cage motor. Another three-phase motor is the SYNCHRONOUS type. This motor is NOT an induction motor. 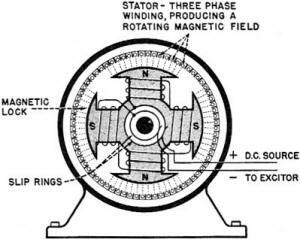 The stator is the regular three-phase rotating field job -but the rotor has field poles ENERGIZED BY D.C. The d.c. is generated by a small generator called an EXCITOR mounted on the end of the rotor shaft. This d.c. is fed into the rotor by means of slip rings. Figure 165. - Synchronous motor. Figure 165 shows the end view of a four pole synchronous motor. Notice that there are just as many poles on the rotor as on the stator. Every rotor south is attracted to a stator north and vice versa. This attraction is the result of a magnetic field between the stator and rotor and is called a MAGNETIC LOCK. As the stator field rotates, the lock forces the rotor to turn with it. Two Greek words - SYN meaning "together" and CHRONOS meaning "time" make up the name, SYNCHRONOUS. SYNCHRONOUS describes the motor's speed - its rotor always rotates just exactly as fast as the field of the stator-"together in time." The synchronous motor is NOT a self-starting motor. Its rotor is heavy and, from a dead stop, it is impossible to bring the rotor into magnetic lock with the rotating field. For this reason, all synchronous motors have some kind of starting device. A simple starter is another motor - either d.c. or of the induction type - which starts the unloaded synchronous job and carries it up to about 90 percent or 95 percent of speed. Then the starting motor is disconnected and the synchronous motor PULLS INTO STEP with its magnetic lock. Another starting method is a second winding of the squirrel cage type added to the rotor d-c windings. This induction winding brings the motor almost up to speed by following the rotating field. Then the d.c. is cut into the synchronous rotor and the rotor pulls into step. The latter method is the most commonly used for starting synchronous motors. Reversing any three-phase motor is a snap. Just interchange ANY TWO STATOR LEADS. By doing so, the phases are interchanged. Z follows Y instead of following X in the process of reversing polarity. The rotating magnetic field goes around the other way. And the rotor follows it-the motor has reversed rotation. These are the three types of THREE-PHASE MOTORS - SQUIRREL CAGE INDUCTION, WOUND ROTOR INDUCTION AND SYNCHRONOUS. All three use exactly the same kind of stator but their rotors are different. Notice that the NAME of the motor tells you what KIND of a rotor is used. Many years ago, two-phase motors were built - but today, it's not likely that you'll ever see one. If you should happen to run across a two-phase job - outside of F. C. equipment or an old ship - just remember that the types and principles of operation are exactly like the three-phase motors. Three-phase motors are the most efficient and all-around best motors built. And if three-phase current were always available, you'd never see a single-phase motor. But it takes a special kind of alternator to produce three-phase voltage. And, when you can't get three-phase - single-phase must be used. Here's what makes single-phase motors less efficient than three-phase - No rotating magnetic field is set up by a single-phase current. If a single-phase motor were built like a three-phase job, there would be induction and opposite poles on the rotor all right-BUT-no ROTATING flux to drag the rotor around. However, if the rotor once gets started, the rotor poles lag a little behind the stator poles. And attraction is set up-torque is produced-the motor runs. Notice that THE SINGLE-PHASE MOTOR HAD TO BE GIVEN A START BEFORE IT WOULD RUN. Starting a motor by hand isn't bad if it's in an electric razor or electric clock. But motors for general duty must be self-starting. And this is the whole problem of single-phase jobs - HOW to make them self-starting. Each single-phase motor is named from its starting method. There are three general types of single-phase motors - the SERIES-UNIVERSAL (at beginning of this chapter), the REPULSION-INDUCTION, and the SPLIT- PHASE. And as you proceed, you will notice that, except for the series-universal, each has a cutout device to remove the starting equipment from the circuit. And they all run as straight induction jobs. Figure 166. - Repulsion motor. Figure 167. - Repulsion rotor with centrifugal switch. Figure 168. - Split phase motor. The REPULSION single-phase motor has a rotor that is wound just like a d-c drum armature. 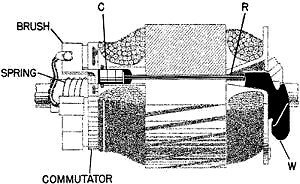 Figure 166 shows a schematic of this motor. Notice that the BRUSHES ARE CONNECTED TOGETHER. 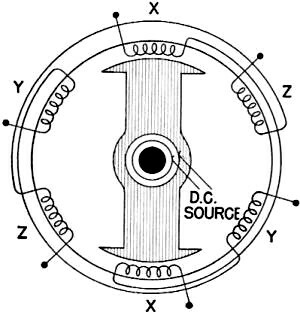 The only current in this rotor is induced by the expanding and contracting single-phase field of the stator. The poles produced on the rotor are located opposite the brushes. Because the brushes furnish the only complete circuit for the current, they insure the pole position opposite their own position. The self-starting of this motor DEPENDS ON THE BRUSH POSITION. In the drawing, the brushes are correctly located for starting. Suppose you moved them. The rotor poles move with the brushes because the brushes carry the current which makes the poles. Try the brushes opposite the stator poles - rotor poles are in line with stator poles. Torque? ZERO. The force is directly in line with the shaft. The motor will not start. Suppose the brushes are moved to a position 90° from the position in the drawing. Torque? Yes, but in a clockwise direction. You've REVERSED the motor. Many of these repulsion motors have a short circuiting device connected with a CENTRIFUGAL SWITCH. When the motor reaches about 75 percent of full speed, the centrifugal switch lifts the brushes off the commutator AND short circuits all the segments. The rotor is just like a squirrel cage job - short circuited. It continues to run - but as an INDUCTION motor. The advantage of this short circuiting is a saving in wear and tear on the commutator and brush system. After all, the brushes and commutator were only put on the motor to start it - and once it gets going, it will continue to run. 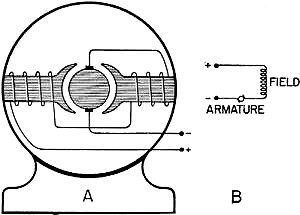 And what is a CENTRIFUGAL SWITCH? It's a movable device with a weight which whirls with the motor. When the force on this weight gets strong enough, it flys out and throws the switch. Figure 167 shows a repulsion motor rotor with a centrifugal switch. W is the weight and R is a rod attached to the weight. 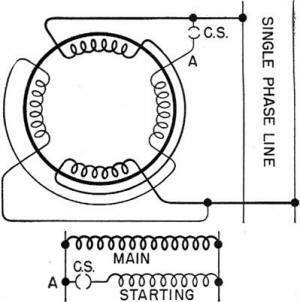 C is a copper ring for short circuiting the commutator segments. When the weight flys outward because of the increased speed, it pushes the rod forward. The rod LIFTS THE BRUSHES and THE RING SHORTS THE SEGMENTS all in one operation. When a repulsion motor is equipped for short circuiting the rotor, it is called a REPULSION-INDUCTION motor. The name comes from the fact that it starts on repulsion and funs on induction. This is a fairly rugged motor - it's one of the best single-phase a-c jobs. The only disadvantage is in the brush and commutator rig. It gets dirty and is subject to wear and arcing. It's always best to use a motor WITHOUT slipping contacts, if possible. The single-phase motors without slipping contacts use a STARTING WINDING. The winding is embedded in the stator slots next to, or over the top of, the main windings. Figure 168 is the schematic diagram showing both main and starting windings. These motors start by SPLITTING the single-phase current into two phases. A single-phase current can be split into two phases by using either a high resistance circuit or a condenser in one of the windings (at point A in figure 168). Then the current in the winding that contains either the resistance or the condenser is out-of-phase (out of time) with the current in the other winding. The two phases produce a weak rotating magnetic field. And-with the rotating magnetic field, a short circuited squirrel cage rotor produces torque. Notice the centrifugal switch in figure 168. It disconnects the starting winding after the motor has picked up speed. This is always necessary in resistance type starting. The winding would burn out, because of its high resistance, if it weren't dis-connected as quickly as possible. The chief advantage of these split-phase motors lies in their lack of commutators and brushes. However, they usually have a poor torque at starting-which means that they cannot be used on large loads. You can reverse a split-phase motor by inter-changing any set of stator leads. This is the same as reversing a three-phase job. Figure 169. - Resistance starter. D-C motors required starter rheostats for motors over 5 hp. A-c motors likewise require some means of limiting current at start. But a-c motors can stand more current without burning - usually only motors of 25 hp or more have starters. That's a good thing because almost all single-phase motors are less than 25 hp. This eliminates the necessity of starters on just about everything except three-phase jobs. All starters have just one main job to do - cut down the current at the start. This job can be done in three different ways. First, by a RESISTANCE. Second, by a TRANSFORMER which reduces voltage across the stator and thereby reduces current (I = E/R). Third, by a STAR-DELTA switch which changes the windings of the stator from a parallel to a series connection (there is more resistance in a series connection). Figure 169 is a schematic of a RESISTANCE STARTER. You can apply this schematic to ANY starter. Just substitute transformers or a star-delta switch for the resistors. Notice that three resistors are necessary - one for each phase. The switch is first thrown DOWN. This puts the resistors in the lines. After the motor has built up speed and it can stand more current, the switch is thrown UP, thereby cutting out the resistance and putting the motor directly on the full line voltage. The MOTOR OVERLOAD RELAYS are interesting devices. They're simply solenoid coils carrying the motor's current. The cores of the coils are attached to the overload contacts. Suppose the motor is over-loaded - drawing too much current. It would soon overheat and burn out if it were not for the relays. The excessive current going through the overload relays sets up a field which pulls the cores up into the coils. The contacts pop open and stop the motor. All of these relays have reset buttons. When the reset buttons are pushed, the core returns to the normal position and the contacts are reclosed. The relay system is a better overload system than fuse protection. The relay can be reset with the flick of a finger. And most overloads are temporary anyway -you wouldn't want to replace fuses every time a motor got a momentary overload. REMOTE CONTROL starters have the starting switch at some handy place. Lines then run to the motor. For example, it's a lot easier to control a bilge pump from the dynamo room, than to have to go down to the double bottoms to turn it on and off. A remote control system simply lengthens the lines from starter switch to motor.